For the first time in the history of the entertainment industry, over 100 Industry Professionals have come together for THE ACTOR'S JOURNEY PROJECT to explain every aspect and facet of an actor's involvement in the motion picture and television industries. 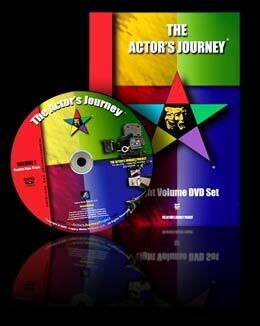 THE ACTOR'S JOURNEY DVD Set is a comprehensive PROFESSIONAL COURSE. There are TEN HOURS of critical information presented on EIGHT DVDs. These DVDs are not about acting or craft. These DVDs are laser focused on teaching you the BUSINESS - or "NON-PERFORMANCE" - SKILLS necessary to launch and sustain a career in today's highly competitive entertainment industry. Each DVD has and approximate running time of 75 minutes. As a first step to learn more about the entertainment industry, most new talent turn to the Internet as a resource tool. Unfortunately, when it comes to the BUSINESS side of the industry, the majority of the information presented on the Internet for and about actors is either inaccurate, incomplete or both. To exacerbate the situation, the information that is available is disseminated by individuals who may have had very brief careers in the industry - or, in many instances - may have NEVER worked in the industry at all! Unfortunately, many of these "self-appointed experts" make a very good living leading uninformed and inexperienced actors down dead-end paths that waste years of time and consume vast amounts of money.